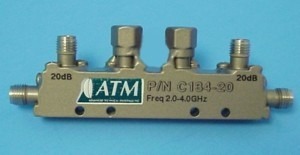 ATM manufactures a wide variety of broadband coaxial directional couplers. We offer coaxial single and dual directional couplers (also know as bi-directional couplers). ATM coaxial directional couplers are designed, manufactured and tested in accordance with applicable military and F.A.A. standards for reliability, performance and quality. In order to assure product quality and reliability of our directional couplers, appropriate inspections and tests are made, controls exercised and data gathered to insure customer satisfaction. The following MIL standards are utilized for all in process controls and final inspection procedures for directional couplers we manufacture: MIL-I-45208, MIL-S-454, MIL-S-202, MIL-S-883 and MIL-S-750. Our directional couplers will meet operating specifications across the temperature range of -55 degrees C to +100 degrees C. MIL-STD-202. Coupling: 6, 10, 20, 30 dB Std., other values available. Finish: Unique corrosion resistant 316 stainless steel epoxy coating IAW MIL-F-14072 color Dusty Grey. General/Product Specific Mil specs : See ATM Mil-Spec reference. Secondary Terminations: May be internal or external depending on model and should not be removed. For connectorized loads, contact factory. Coupling: 10, 20, dB Std., other values available. Coupling: 10, 20, 30 dB Std., other values available.